Our first night in Vegas. We were looking to have a mellow evening. After all, we’d woken up at the crack of dawn, had a nightmarish trip out there, went to an awards luncheon, presented a 2-hour seminar…all before 4:30 p.m.
We started with a martini. A wonderful Ketel One martini. Well, one for each of us. Straight up with olives. Soon after the Lobster Martini came – it was lobster and polenta in a martini glass. It might not sound heavenly, but it was. Seriously. But I’m not allowed to write about the food so I’m going to have to stop. Besides, I’m getting hungry here. Our waiter’s name was Julian. He was Italian. Couldn’t have been in this country for long. He was funny and adorable. The restaurant wasn’t crowded (with the time change, we were eating with the seniors!) so Julian could spend a lot of time talking to us. And he did. Andrew and I were talking about the photograph on the wall. Just like that one up there, but the mirror image. I called them the brat pack. Even I laughed at that slip up. 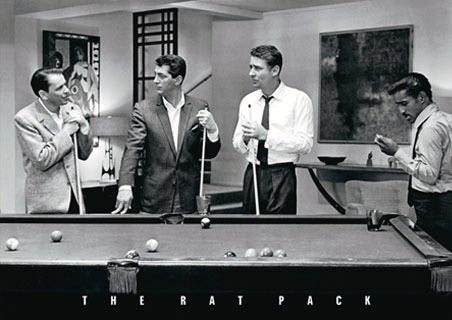 So there they were – The Rat Pack – such handsome young men. We burst out laughing. Maybe it was rude. But who could help it? So Andrew asked Julian who Shapiro was. He explained (after pointing to Peter Lawford) that the owner, Marc, had told him that Lawford’s name was Shapiro. When we caught our breath, we suggested that he tell Marc that there is no Shapiro in The Rat Pack. Joey Bishop. But no Shapiro. The rest of the trip (and maybe for the rest of our lives) when there was a dull moment, one of us would say, “Shapiro” and we’d crack up. So here’s to you, Julian. just came across your site. you’re a poker player? do you have a local game that others (me) could get into? This is hilarious! What a great way to start your “real” trip to Vegas. Truly a memorable evening. I say we raise a glass to Shapiro and toast Julian as well! Liz – yes, too funny. Shapiro! Hey pallie, like great pix and great story. My fav packer was of course Dino….never was, never will be anyone as cool as the King of Cool.